This property measures 380 m2 overall and is composed of a main villa, an outbuilding overlooking the swimming pool for guests, and a bright garage used as a study. The main villa has one floor and features a spacious entrance hall. The living area is large and bright thanks to its big windows, and directly overlooks the stunning garden surrounding the property; it is warm and cozy thanks to Tuscan cotto-tiled floors and a big fireplace. The sleeping area is composed of two elegant and comfortable bedrooms and two bathrooms. The main villa also features an eat-in kitchen in the living area and a big room at basement level which may be converted into a relaxation or fitness area. Adjacent to this stunning villa you will find the outbuilding, the perfect place to put up friends and guests; it is composed of a kitchen, a bedroom and a bathroom. This property is completed by a big garage with glass walls used as a study area. 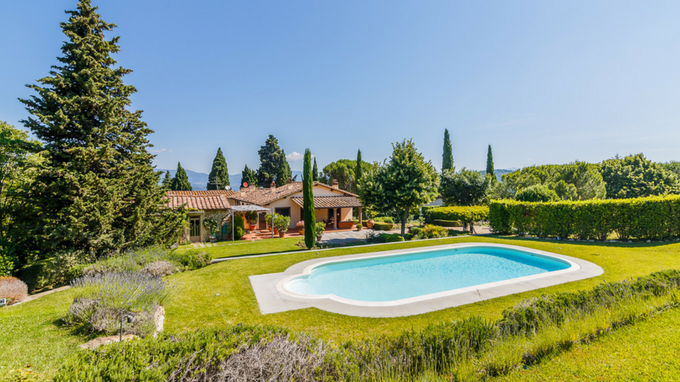 Located in a context that guarantees utmost privacy, this villa is surrounded by a luxuriant, well-tended garden measuring 3 hectares and by over 7 hectares of olive groves; there is also a swimming pool with a sunbathing area. This villa at the outskirts of Florence, the cradle of the Renaissance, is equipped with all comforts and well connected to the main attractions offered by the city centre of such a lively and popular city with a very important artistic and cultural heritage.